The Federal Reserve will continue increasing borrowing costs this year despite the toll on the U.S. economy from Hurricanes Harvey and Irma. Let's see how the stock market reacts. The Federal Reserve will continue increasing borrowing costs this year despite the toll on the U.S. economy from Hurricanes Harvey and Irma, Germany's Deutsche Bank said, echoing a similar prediction by New York-based rival Goldman Sachs. Not only will the Fed start reducing the size of its $4 trillion-plus balance sheet starting Oct. 1, but the U.S. central bank will also raise interest rates at least once before the end of the year to about 1.4%, Deutsche Bank wrote recently. Lower-than-expected inflation readings this year had prompted many traders and analysts to bet that the Fed might delay the moves. The predictions come as the central bank's policy-setting panel, the Federal Open Market Committee, prepares to meet this week, with Chair Janet Yellen scheduled to host a press conference on Sept. 20. Deutsche Bank expects the Fed to boost its forecast for 2017 inflation to 1.8% after the meeting, versus a 1.6% projection made in June. "A comfortable majority of current voting FOMC members would still seem to support another rate hike this year so long as inflation data continue to hold up in the months just ahead," Deutsche Bank Chief Economist Peter Hooper wrote in the report. Goldman Sachs said recently that while damages from Hurricanes Harvey and Irma over the past month are likely to total more than $100 billion, their impact on economic activity could be short term, since a reconstruction boom is likely to follow. The firm's chief economist, Jan Hatzius, wrote in a report that the probability of another Fed rate hike this year had increased to 60% from 55%. The Fed cut rates to near zero amid the financial crisis of 2007-2008 and held them there through late 2015 in an effort to heal the economy through low borrowing costs. At the same time, the central bank bought up trillions of dollars of U.S. Treasury bonds and mortgage-backed securities in an unprecedented effort to further ease monetary conditions. This year, the Fed has raised borrowing costs twice by a quarter-point; the current target is a range from 1% to 1.25%. A string of surprisingly low inflation readings had prompted many economists and investors to bet that there was little risk of the U.S. economy overheating, and therefore scant motivation for the Fed to raise rates. The most-recent inflation figure, however, "should damp the impulse to downshift the policy path at this point," Hooper wrote. The U.S. Department of Labor said that its Consumer Price Index jumped 0.4% in August, accelerating from 0.1% in July. The August pace also exceeded the average 0.3% estimate of economists in a FactSet survey. A caveat is that the hurricanes may make it harder for Fed officials to discern longer-term trends in economic growth and inflation, according to Hooper. "The Fed's job of distinguishing between moves in the trend versus transitory volatility in the data will be difficult in the coming months, due to the likely large effects of the recent hurricanes," the economist wrote. He expects the Fed to maintain its projection for three rate hikes in 2018, to end the year at 2.1%. Another factor arguing for a rate increase: President Donald Trump's preference for low interest rates. 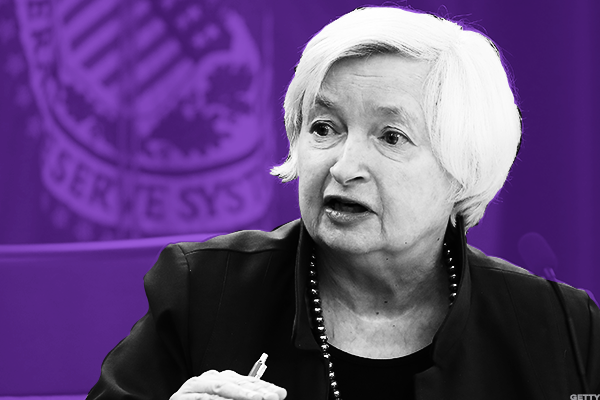 Yellen's four-year term as chair expires in January, and with Fed Governor Stanley Fischer's recent announcement that he'll step down in October, Trump is likely to nominate new Fed board members who will keep rates low, according to Hooper. "Mindful of the risks that this policy bias could pose down the road, everything else equal, Yellen may just want to get one more rate hike done," he wrote. The U.S. Department of Labor said Thursday that its Consumer Price Index jumped 0.4% in August, accelerating from 0.1% in July. The August pace also exceeded the average 0.3% estimate of economists in a FactSet survey.